The synthesis problem asks for the automatic construction of a system from its specification. In the traditional setting, the system is “constructed from scratch” rather than composed from reusable components. However, this is rare in practice, and almost every non-trivial software system relies heavily on the use of libraries of reusable components. Recently, Lustig and Vardi introduced dataflow and controlflow synthesis from libraries of reusable components. They proved that dataflow synthesis is undecidable, while controlflow synthesis is decidable. The problem of controlflow synthesis from libraries of probabilistic components was considered by Nain, Lustig and Vardi, and was shown to be decidable for qualitative analysis (that asks that the specification be satisfied with probability 1). Our main contribution for controlflow synthesis from probabilistic components is to establish better complexity bounds for the qualitative analysis problem, and to show that the more general quantitative problem is undecidable. 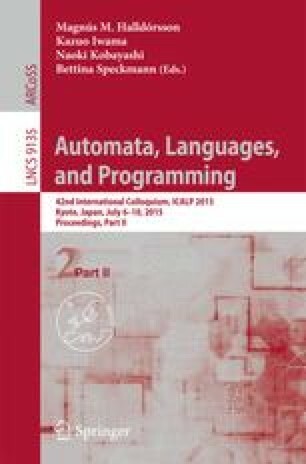 For the qualitative analysis, we show that the problem (i) is EXPTIME-complete when the specification is given as a deterministic parity word automaton, improving the previously known 2EXPTIME upper bound; and (ii) belongs to UP \(\cap \) coUP and is parity-games hard, when the specification is given directly as a parity condition on the components, improving the previously known EXPTIME upper bound. This research was supported by Austrian Science Fund (FWF) Grant No P23499- N23, FWF NFN Grant No S11407-N23 (SHiNE), ERC Start grant (279307: Graph Games), EU FP7 Project Cassting, NSF grants CNS 1049862 and CCF-1139011, by NSF Expeditions in Computing project “ExCAPE: Expeditions in Computer Augmented Program Engineering”, by BSF grant 9800096, and by gift from Intel.